Yep, it’s true that a warm hug from a best friend, a hand-in-hand walk with a loved one, or a kind word from a spouse doesn’t cost a single penny, but they’re worth millions. So, how about the items we need for our day-to-day existence? Is it possible to run over to Super Mega-Mart and walk out with all the food needed for the week, all without spending a cent? Do you think the corporate folks at Super Mega-Mart might take pity on us during these tough times? Every heard of them simply handing out groceries to folks with no cash or credit required? So, if Super Mega-Mart is not handing out free grub, it follows that today’s Texas full-time working musicians, no strangers to scratching and scraping to earning a living, would be keeping tabs on every CD sold, stashing away every last coin earned in their piggy banks. The more sold, the better, right? Leslie Anne Sloan, also known as Miss Leslie, a fiddle player extraordinaire from Houston, Texas and leader of Miss Leslie and Her Juke-Jointers, is on a twofold mission: first, to put the “real” back into real country music, and second, to bring that music to the masses, one fan at a time. And to accomplish her goal, she has grabbed the traditional music business model and pulverized it, smashed it, and broken it into a million pieces. Her idea is simple. Instead of selling her latest release, Between the Whiskey and the Wine, she’s decided to give it away. For free. At no cost to the listener. Yes, really. Born in Charleston, South Carolina, Leslie was the child of a bluegrass-loving church minister and classically-influenced pianist. At age 5, Leslie began her own music ministry when she took her first Suzuki violin lesson, then continued her training while the family moved to Kentucky, Ft. Worth, and finally Houston. At the age of 14, Leslie became a charter member of her family’s band, playing opry events and free bluegrass shows in the Houston area. 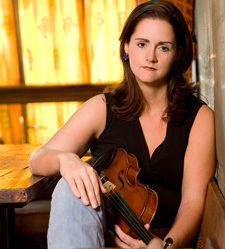 Leslie continued to develop her skills while studying classical violin and opera at the university level before “college burnout” sent her to the corporate world. 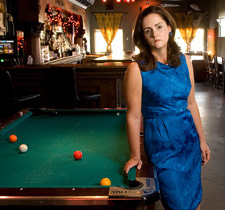 Good money followed, but the desire to play fiddle burned bright, so in 2004, she and then-husband Randy Lindley started the first version of the Juke-Jointers, a 7-piece group with a “big band honky-tonk sound” that traveled everywhere their 15-passenger van could manage. In 2005 they released “Honky Tonk Revival”, followed by “Honky Tonk Happy Hour”, a live album recorded at Houston’s Continental Club in 2006. Musical, personal, and personnel changes brought a leaner version of the Juke Jointers to the stage in 2006. An amicable divorce between Leslie and Randy, along with differing musical interests, led to a new and dynamic version of an already successful band. Now a 4-piece, complete with upright bass, pedal steel guitar, drums, and Miss Leslie’s ever-present fiddle, a new emotion and passion emerged. The result was “Between the Whiskey and the Wine”, a 13-song collection of originals from the pen of Miss Leslie, all recorded deep in the heart of Floresville, Texas at Tommy Detamore’s studio. Though originally scared by the band’s upheaval, Leslie came to realize that in this case, smaller meant better, and what were once notes on a page became instant Juke-Jointer classics. Recently, Miss Leslie sat down with Americana Music Times to talk about her future, including such topics as being the President of Music, e-mailing fans, and giving away her CD in the hopes of building a fan base. My focus would be a grass-roots perspective where we get back to what it’s supposed to be about, which is the music. It seems we’ve made music a lot about things that have nothing to do with music, especially popular music and country music, which is, for the most part, popular music. It’s all about a certain look, a certain “sound”, or putting everything into one kind of mode or model. If we could, we need to get back to some kind of free market where people can put out music and see if others like it. Nowadays it’s not like that, but more “Let’s shove something down people’s throats that they need to like.” It’s become a capitalist regime instead of a free market situation. That it was part of the end of a journey. I definitely had a feeling of closure, similar to the feelings I had when I heard the very last note of the very last song when I listened to it all the way through. It’s everything you’ve missed from real country music. I grew up with classic country and in the 80s when George Strait and Ricky Skaggs came along I fell head over heels with country music and that 4/4 shuffle. I love twangy guitars and the crying pedal steel guitar. And, if you’ve got a smooth fiddle on top of that, you’ve got country music right there. For me, that’s what this album is, that spirit, that feeling of country music. This will take you back to those feelings, but the songs are written in a modern-day verbage. The way people talked in the 50s and 60s is very different now, and these songs are written in a way that you don’t feel like you’re listening to songs from the 50s. But, it’s got that sound that you always loved and you missed hearing about real country music. Giving away her CD, Between the Whiskey and the Wine, for free, just for taking the time to send her an e-mail. I read Bob Lefsetz’s e-mail newsletter. He’s constantly writing about industry trends, but his perspective is from a real, genuine, music place. He talks about ways that you as an artist can promote yourself in more real way rather than just following all the latest industry hype. So, he wrote this newsletter about a guy named Cory Smith, who was a schoolteacher with a wife and two kids who also gigged on the weekends. He had a manager that was trying to help him play music fulltime and support his family, and the manager had the idea to give away the CDs for free and build a fan base that way. Next thing you know, the guy is huge. Now obviously he’s not some kind of chart-breaker, but he’s a guy that’s able to go pretty much anywhere in the country to put on a show, and he can assemble his fans, and they’re loyal, dedicated, and all about the music. Now, not everyone can do this. If you’re not a good band, it’s not going to work for you. You can give your CD away all day for free, but if it’s no good people will say, “Uhhh, I don’t want it.” So, I started thinking, “Can this work for country? Can this work for roots country? Can this work for me? Am I good enough? If I gave CDs away for free, and this music reaches people, what will it mean? What will a bigger fan base mean? Will it mean that I can travel pretty much anywhere I want and have fans show up at the show?” I don’t know if I’ve completely answered that question yet, but I thought, “I want to try this. I want to see what it can do, because what I’ve done so far hasn’t reached enough fans.” My New Year’s resolution became, “In 2009, I want to be more about the music and I want to reach real fans.” So, this is my big experiment. What her band and management thought about her decision. Fan response to the CD giveaway. It’s been huge. I had 300 requests in the first week. Obviously it’s not Mariah Carey-huge, but I was very surprised, because I thought I might get 20 the first week. I was just overwhelmed and just tried to get CDs out the door as fast as I could. Also, blogs that I had previously corresponded with that really hadn’t given me a response back have all jumped on the bandwagon. I think there’s a huge curiosity factor. It’s like, “Well, can that work? Is that absolutely crazy, or is this really a model of what’s going to happen going forward, where the artist makes her living off of shows rather than CD sales?” I have people telling me that they’re coming to shows that are 2-3 weeks or even a month down the road. I write people back and just say, “Spread the word.” Think about it. Who are you going to tell? Your friends, right? Well, you and your friends all live in the same area, so if you build a fan base region by region, it makes sense that if you meet fans at events, or correspond to them through e-mail, you could have a fan base in, say, New York, one that started with 2 or 3 people. Keeping in direct contact with fans. I believe that to build a fan base for life, there is nothing better that you can do than to have a personal interaction, as much as you can, with fans. I’ve seen that work in so many areas. As a fan, there’s nothing that thrills me more than if I can go up at a show and talk to the artist that I like. If they’re nice and responsive, I go away from that thinking that not only do I love the music, but I think, “What a cool person.” From an Internet perspective, how cool is it to e-mail the artist and have him or her e-mail you back, or put a comment on your MySpace? When the artist gives you that personal touch, you will be a fan for life. Music is not just about putting notes on a page, but about being able to connect with someone, and to have that person connect back. If it can happen in a more direct way, I think that’s priceless. Miss Leslie wants to hear from you, and yes, she’s willing to give you her new CD. Yep, for free. First, simply contact her via e-mail at and provide her with your e-mail address. (Adding a note of thanks and support would be great!) Next, simply wait for Between the Whiskey and the Wine to arrive. Then, after receiving your CD, sit back and enjoy the sounds of pure country. Also, visit her website at www.missleslie.com to see when she’s appearing in your neck of the woods. Finally, support her grassroots efforts by attending a show and make sure to stop afterwards for a visit. It’s time to spread the word.